When we talk about safety within materials handling we are not just referring to powered equipment. 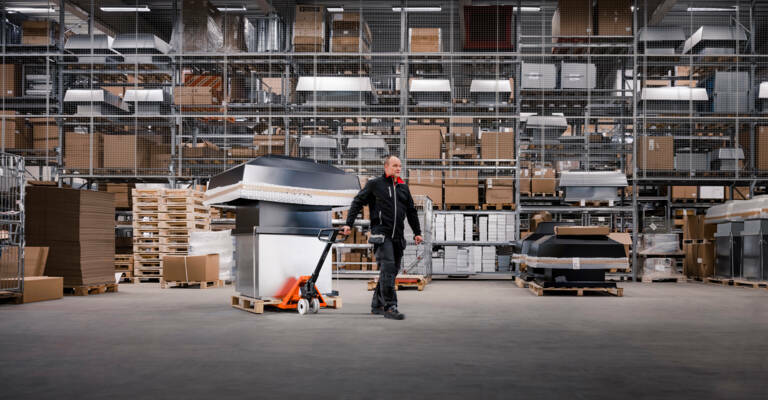 Manual equipment such as hand pallet trucks can also provide a risk to safety. So since its Safetember, we wanted to give you some advice and tips on how best to operate a hand pallet truck safely. Visually inspect the truck for damage or cracks. Raise the forks to check the hydraulic pump is in working order by pressing the lever downwards then operate the handle. Raise forks fully and look for any sign of hydraulic oil leaking. Before entering the pallet check the load is securely stacked and the pallet is not damaged. Carefully guide the forks into the gaps of the pallet by firmly gripping the handle with two hands and in the up-right position push steadily forwards. Raise the forks ensuring there is sufficient space between you and the handle, once the pallet is clear of the floor, return the lever to the neutral position. Ensure there is enough clearance when raising the forks; be aware of any overhead obstructions and any width restrictions. Push the handle down, turn and face the direction you will be travelling, depending on the direction you are turning with determine which hand to hold the truck with. When turning left use your left hand, when turning right use your right hands and grip the handle firmly. Check around for pedestrians and other trucks; ensure your route is clear of obstructions. With the handle low, gently pull to start the truck moving with the forks trailing (behind you). Walk to one side of the truck, always travel at a safe speed and wherever possible travel on the left hand side of the aisle. Always walk. Never run, make sharp turns or stand directly in front of the pallet truck when travelling. Never stand on the inside of a turn. When travelling down a slope with the truck loaded keep the load facing down and control the speed by pulling back with both hands on the handle. Once at your destination, manoeuvre the load into position, ensure you are clear of the load before lowering by slowly pulling on the lever, and lowering the load under control. When fully lowered release the lever into the neutral position. Check all around if it is clear to stand to one side and pull the hand pallet truck clear of the pallet.